Blog Do Push Ups Build Muscle? When one talks of building muscle, it’s automatically assumed that the only way to do so is to start pumping iron. And, while I can’t say I disagree given my fanatical love of weight training, I think it’s important not to turn out backs on the old, simpler methods: those which don’t require equipment, and which we can do anytime, anywhere. 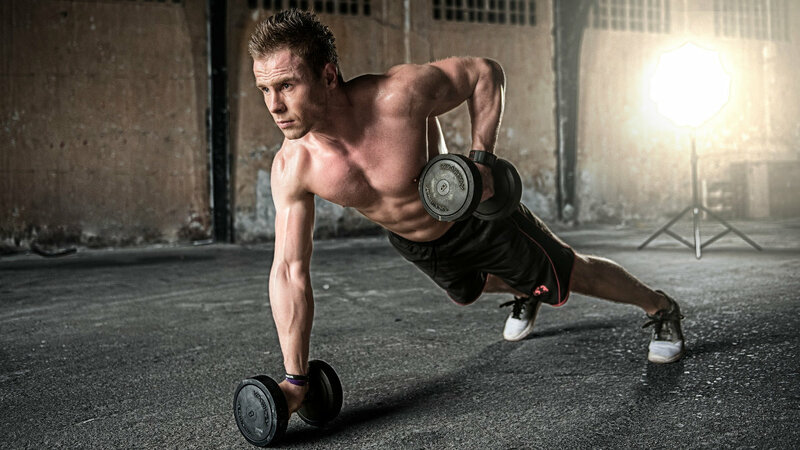 Possibly the most famous of weight-less muscle building exercises is the push up. For those who haven’t caught it yet, the push up is pretty much identical to the bench press, barring a few differences. The push up is an exercise which works the deltoids (shoulders), chest (pectorals), the triceps, and – because of the way the body is held up – the lower back. And, yes – under certain circumstances, push ups can and will build muscle. Just because we are not using weights here, don’t think that the simple, basic rules of building muscle suddenly fly out of the window… no, they still apply. In order to build muscle, and to continue building muscle, a person must constantly be training against increasing resistance (more weight). So, to an extent – particularly to the untrained individual – push ups will certainly help with a large portion of the upper body and arms, but, unless more resistance is added, even though endurance gains may continue, actual strength and size gains will stop eventually. Push-ups are a compound exercise, meaning they involve the use of more than one muscle group and joint. If you’re looking for washboard abs and a strong core, then push-ups might just be the perfect starting point. By core, we mean the abdominal section, waist, side of the waist and everything right down to the pelvis. Strong core muscles allow you to do physical activities with ease, help with back problems and maintain good posture. Strength-training exercises aren’t generally thought of as big calorie-burners, but they can be. Because so many muscles are involved in a push-up, the exercise helps you torch more calories than many other exercises that only involve one or two muscle groups. This is because the more muscle recruitment that takes place during a movement, the more energy your body requires to perform the movement — energy in the form of calories. You’ll burn more energy doing a push-up than you will doing a triceps push-down, crunches, or even bench presses. Push ups are classified as a compound exercise as it calls upon multiple muscle groups. When you simultaneously engage large muscle groups, your heart must work harder to deliver oxygen-rich blood to muscle tissue. Ultimately, this activity results in an effective cardiovascular exercise, which supports heart health and promotes the reduction of stored body fat. If you need more of a challenge, you’ve got options. Elevate your feet, do clapping push-ups or put a weight plate across your upper back. Be sure you can do eight to 12 traditional push-ups with perfect technique before you progress to more advanced versions. Gaining muscle mass can be a difficult process. You have to stress the muscle and then provide it with the proper nutrients to help it rebuild. This sounds simple enough, but actually doing the work can be very tough! Pushing your muscles to the point that they will grow becomes more difficult over time as your body adapts to the workout, so it’s important to progressively make your workouts more challenging. Keep challenging your muscles with the push-up you need to keep making the push-up more difficult. Perform push-ups from the knees, from a standard plank, with a weight on your back or one-armed. To pick the right type of push-up, judge it by the amount of repetitions that you can do. Typically, people trying to gain muscle do exercises that allow them to do 10 to 20 repetitions. In that repetition range, the exercise is difficult enough that you can’t do a very high amount of repetitions, but easy enough that you can use proper form and stress the muscle sufficiently. In order to gain muscle mass, the exercise should be difficult enough that it isn’t an endurance exercise, which is usually considered to be above 20 repetitions. I have a tip for you: wear a back pack, and, load it with progressively heavier items as the week’s progress. While you are continually adding more and more weight to the amount you push up, there is no reason why you shouldn’t keep growing – providing you eat enough to sustain the growth, that is. So, yes – push ups do build muscle, and as your gains slow down you can make it progressively challenging to keep gaining additional muscle mass.